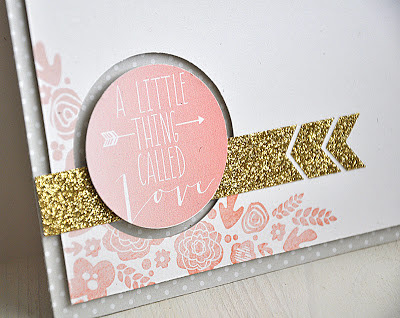 I'm back this month with my newest additions to my Stamping Simply line up for the February Papertrey Ink release. I couldn't be more thrilled to introduce to you my three new sets... Irresistibly Ikat, Watercolor Wonder and Mini Blooms. Today I'll be sharing a brief look at all three sets and in the following days I'll go into a bit more detail about each. In the meantime, keep in mind that each of these sets will be available for purchase beginning February 15th at Papertrey Ink. First up, Irresistibly Ikat. Ikat patterns can be found in all the latest fashion and decor trends. I'm happy to bring this popular pattern into stamp form! This card features the largest focal image from this pretty patterned set. 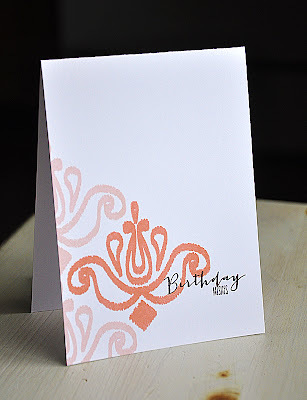 I stamped this ikat medallion in a color combo of melon berry and sweet blush onto a white card base. Then finished the card off with a sentiment (also included in Irresistably Ikat). I must admit... 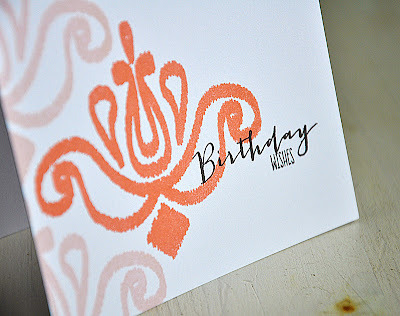 I am a huge fan of this font combo, it pairs perfectly with the ikat. Second, Watercolor Wonder. Here's a fun set that allows you to recreate the look of artistic paint strokes, without out the mess of getting out a brush and paints. 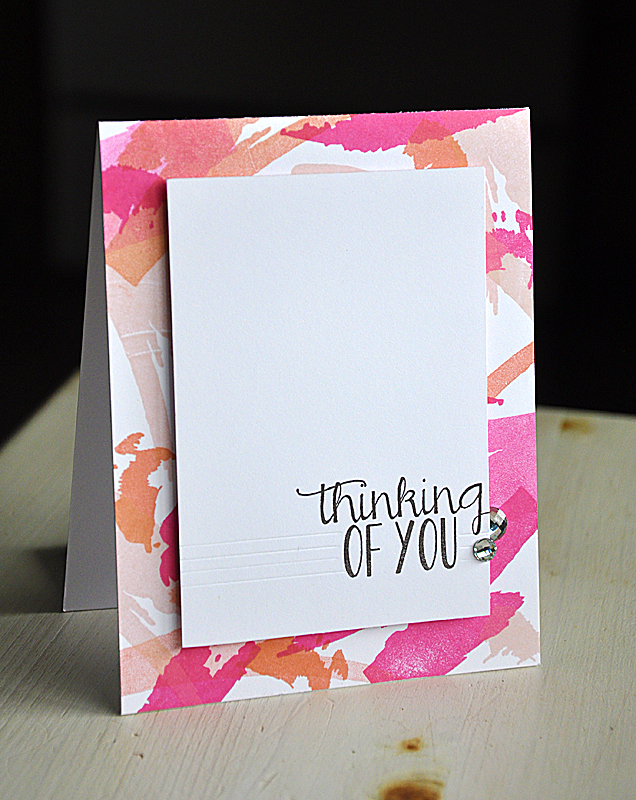 I built a hand stamped pattern onto the white card base using a few images from Watercolor Wonder in a color combo of raspberry fizz, sweet blush and melon berry. Fished the card of with a simple sentiment panel. Stamped the panel with a sentiment from Mini Blooms (also shown below), scored a few lines and embellished with Studio Calico gems. Last but not least, Mini Blooms. A new floral set that is trendy, yet illustrated in such a way that it will stand the test of time. For this card I've paired it with my free printabla image, found here. The card base is covered with a sheet of soft stone pattern paper. Over that is layered a cardstock panel, stamped with a pre-assembled floral cluster (inked in sweet blush and melon berry) and then punched using a 2" circle punch. 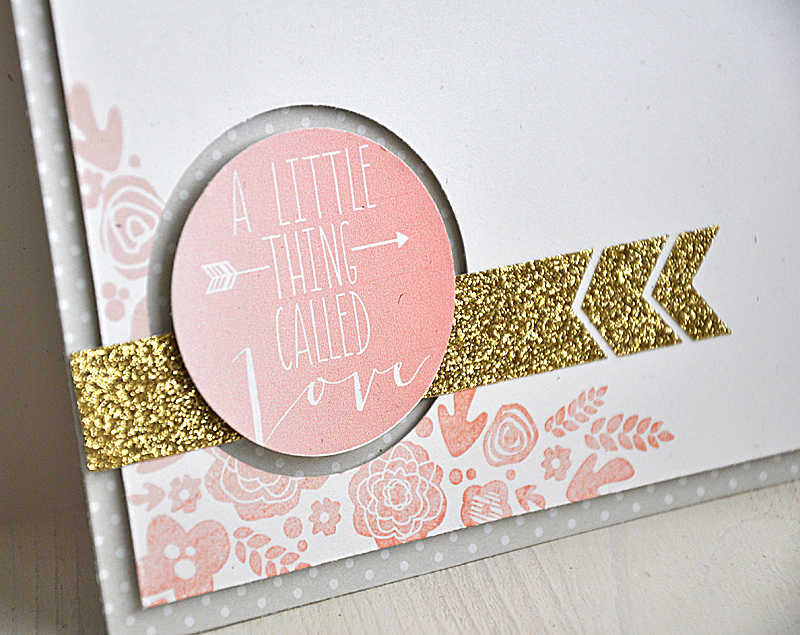 Over the hole is layered some American Crafts glitter tape (trimmed it into a trio of notched pieces, such a fun look!) and the printable ombre circle. Each set will be available for purchase beginning February 15th at Papertrey Ink. Now, be sure to visit Nichole Heady, Besty Veldman and Erin Lincoln for new peeks. Also, Heather Nichols, Dawn McVey, Melissa Bickford & Lizzie Joneshave peeks to share with you of their newest sets for the month. Oh my, you never disappoint, love your 3 new sets especially the wondercolor wonder! Love the C&S look! I have to say that I REALLY like the watercolor set. Such a surprise because it's so outside of my comfort zone, but I cannot wait to see more. And, I LOVE the Ikat. Absolutely LOVE! Wow, I love the watercolor set. I must have it. Love it Maile!! 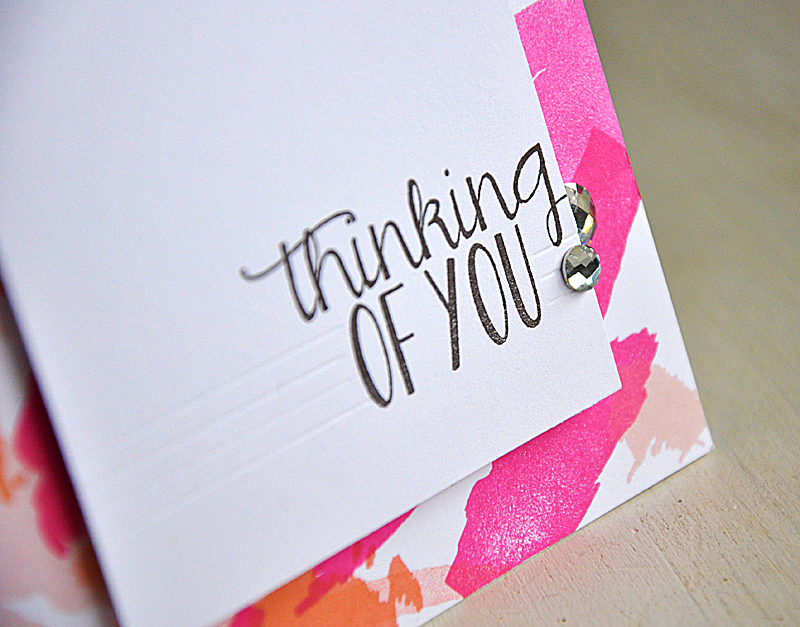 The font on the sentiments is rocking!!! I cannot wait to see more of Watercolor Wonder - just from the sneaks that set is #1 on my list! I love the font combo choices in your "Thinking of You" sentiment!! Totally in love with your new Ikat and watercolour sets. Just gorgeous! And I love what you did with that American Crafts glitter tape, ingenious :) Can't wait to see what else you come up with this week. Thanks Maile. Can't wait to see all the Irresistibly Ikat set! Oh Maile - can't wait - your sets are always so versatile! I too am an aspiring blog writer but I'm still new to everything. Do you have any points for beginner blog writers? I'd really appreciate it. Hi there everyone, it's my first pay a quick visit at this website, and article is really fruitful in support of me, keep up posting such articles. How can I buy your your stamps? Looking forward to seeing all the stamps in each set! Love your samples! I love love love the watercolor wonder!! is also up to the service provider to keep a watch on such activities. its keyword. This is the best part to ensure complete uniqueness to each of the websites. often confuse using these terms. Lastly, make sure that you have a reliable work-at-home office. found. ), watching movie trailers or other people's funny animal videos. ' Every page should be optimized with additional keywords. will be very helpful if any person search in images sections. should see tons of unique informative content. The content must complement the theme of the website design. Oh WOW! That Watercolor Wonder set looks so artsy and fun!!! Can't wait to see more details about your new sets! You never cease to amaze me, Maile! 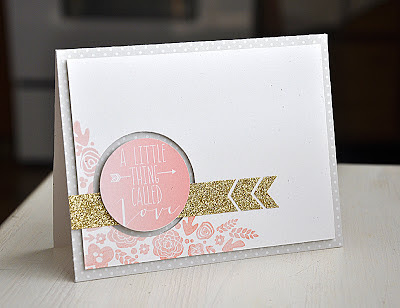 Love your stamp sets & how you've showcased them here! I cannot wait for my order to come with the Ikat and Watercolor set. I LOVE all the stuff you did with them, and I cannot wait to play with them myself! I think the Ikat set will be a new go-to set for me! I love the first card! The colors are so pretty and I love the CAS design. And it's one layer! Love that. :) Your 2nd card really sold me on the watercolor set. I LOVE what you did with it! So pretty! Love the colors you used! The 3rd card is so sweet and pretty! Love the colors and the touch of gold!